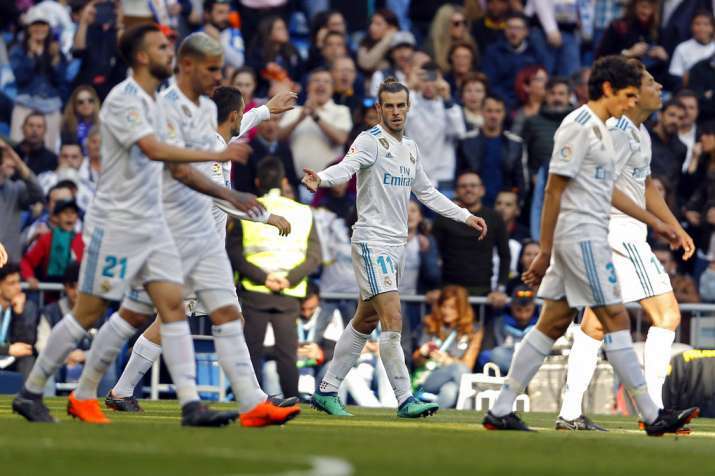 Ronaldo and captain Sergio Ramos weren't included for the match at Santiago Bernabeu Stadium, while Marcelo, Luka Modric and Lucas Vazquez stayed on the bench. Real Madrid rested Cristiano Ronaldo and other regulars for the Champions League and still got the win it needed to stay in contention for second place in the Spanish league. Madrid defeated Bayern Munich 2-1 in Germany last week to take the edge going into Tuesday's second leg of the Champions League semifinals at the Bernabeu. Madrid is trying to return to the European final for the fourth time in five seasons. Bale and Karim Benzema, who didn't start in the first leg against Bayern, were in the lineup against Leganes. Casemiro was the only player to start in both matches. "I'm happy with the attitude of my players, it was exemplary," Madrid coach Zinedine Zidane said. "The first half was phenomenal." Darko Brasanac scored midway through the second half for Leganes, which earlier this season eliminated Madrid in the Copa del Rey quarterfinals. The southern Madrid club dropped to 16th in the 20-team standings and is not fully clear of relegation with three matches left. Leganes midfielder Gabriel Pires was sent off in injury time. Barcelona needs a draw at relegation-threatened Deportivo La Coruna on Sunday to win its third La Liga in four seasons. "We can't be happy with how things unfolded in La Liga," Zidane said. "We lost too many points in the beginning." Madrid has a game in hand, at Sevilla. Sevilla coach Vincenzo Montella was fired on Saturday because of poor results, and replaced by Joaquin Caparros, who coached the team in the early 2000s. Villarreal strengthened its grip on sixth place and a Europa League spot by defeating Celta Vigo 4-1 at home thanks to a first-half hat trick by Carlos Bacca. The win gave Villarreal a six-point gap to seventh-place Sevilla, which holds the final Europa berth. Villarreal is two points behind fifth-place Real Betis, which hosts last-place Malaga on Monday. Villarreal has a game in hand, at Barcelona. Real Sociedad defeated Basque Country rival Athletic Bilbao 3-1 to keep alive its chances of earning a Europa League spot. The host took advantage of two own-goals by Athletic defender Mikel San Jose. Mikel Oyarzabal also scored for Sociedad, while Raul Garcia put Athletic on the board by converting a second-half penalty kick when his team already trailed by three goals. Sociedad midfielder Ruben Pardo was sent off near the end only a few minutes after being substituted in. Sociedad moved to 10th place, two points from Sevilla in the Europa League qualification zone. Espanyol was unable to secure its salvation after being held at home by already relegated Las Palmas 1-1. A victory would have been enough for Espanyol to stay in the first division, but it needs to hope Deportivo La Coruna loses points against leader Barcelona at home on Sunday to be able to guarantee its salvation this weekend. Espanyol is 12 points in front of Clarence Seedorf's Deportivo, the first team inside the relegation zone. There will be three rounds left after this weekend. Espanyol is winless in seven games and had lost four in a row entering the weekend.